The Hand Carved Series from Artistic Tile is comprised of several collections ; Ambra, Ziva. The Ambra Collection is available in Bianco Carrara,Gris, Moss Green, and Lake Blue. In the Ziva Series the material is available in Bianco Carrara, Gris, and Lake Blue. 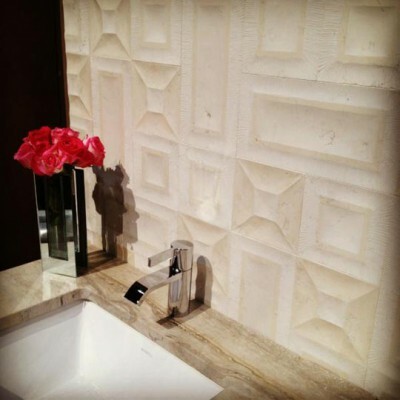 The hand crafted tiles are made in India using traditional techniques which give the three-dimensional stone tiles a combination of both matte and glossy finishes that provide a sense of depth and movement.